A Federal High Court in Abuja has stopped the Independent National Electoral Commission (INEC) from proceeding with the collation, conclusion and announcement of the result of the governorship election in Bauchi State held on March 9, 2019. Justice Inyang Ekwo gave the order following an ex parte application filed by the All Progressive Congress and the incumbent governor of Bauchi State, Mohammed Abubakar. He held that the order would last till the determination of the suit brought before the court by the two plaintiffs. In the ex parte motion, the APC and Governor Abubakar prayed the court for an order of Interim Injunction restraining INEC from resuming, concluding or announcing the result of the Tafawa Balewa Local Government Area of Bauchi State in respect of the election to the office of Governor of Bauchi State. 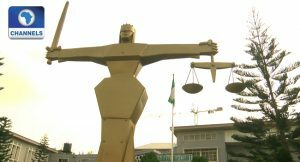 Justice Ekwo had at the last proceeding, while ruling on the ex parte a pplication ordered INEC to appear before him on Tuesday to show cause why the order sought by the two plaintiffs ought not to be granted. Lawyer to the plaintiffs, Ahmed Raji, however, objected to the application of INEC, informing the court that the order issued on Monday asking the electoral body to show cause why the requests of the plaintiffs should not be granted had not been obeyed. The judge, however, refused to grant the request. Justice Ekwo held that since the ex parte application was in writing and duly served on INEC, it behoved on the defendant to appear before the court with a written or formal response. In his ruling, the judge granted the interim injunction restraining INEC from resuming, concluding and announcing the governorship election result in Bauchi State, pending the determination of all issues raised by the plaintiffs in their originating summons. Justice Ekwo also granted an accelerated hearing in the matter and ordered parties to appear before him on Wednesday to present their positions in the substantive matter. The plaintiffs in the suit are challenging the decision of INEC to resume collation of results of the election that was earlier declared inconclusive. They prayed the court to compel the electoral umpire to go ahead with a rescheduled election slated for March 23, instead of reversing itself on the earlier announcement.